12 Mount Champagne - Champagne Valley Accommodation. 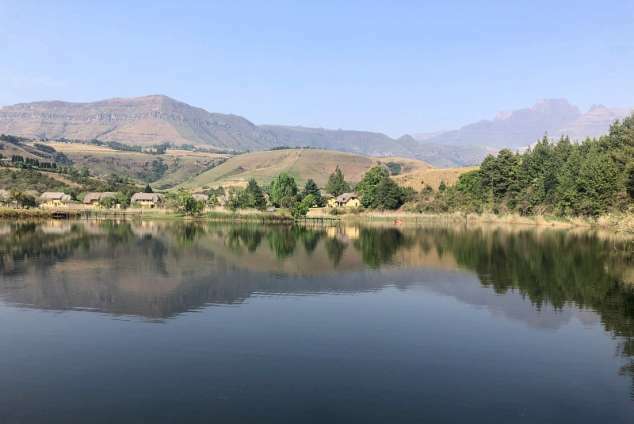 12 Mount Champagne is an 8 sleeper, fully equipped, self catering cottage based in a small family friendly resort in the Champagne Valley area of the breathtaking Drakensberg Mountains. The house is very comfortable - with big beds & a cosy log fire for those winter months. Facilities inside the house include hotel bouquet DSTV (satellite), fully equipped kitchen, 2 bedrooms with en-suite bathrooms & a downstairs bathroom too. Facilities at the resort include a swimming pool, children's playground, tennis court, and a dam, which you can canoe or fish on. Paddles are included in the cottage and canoes can be found at the dam, but please bring your own fishing rods. As our guests you are able to use all the facilities of the adjoining Dragon Peaks. There are so many wonderful things to do in and around the Champagne Valley. Most Giant's Castle caves contain San art (and thus may not be used for overnight shelter), but the highlight is undoubtedly the Main Caves' Museum, where audio-visual and standing displays depict the 'home life' of these tragic nomads. This sector is probably also the best for game and bird watching, and along with the protected rock paintings, many of the World Heritage Site's threatened treasures are found here. These include rare birds of prey whose eating habits can be studied at the Vulture's Restaurant while trout streams provide visitors with the opportunity of catching their own free lunch! Numerous well-maintained hiking routes traverse the valleys of Giant's Castle, and KZN Wildlife operates accommodation facilities in each of the three main areas - chalets and cabins at Injasuti in the north, and campsites at Hillside in the east plus the Main Camp to the south. The Central Drakensberg is renowned for its family and sport-related resorts and a range of adventure and eco-tourism pursuits. Many of these such as the newly introduced 'Drakensberg Canopy Tours' are particularly special experiences which you will never forget. Take the N3 passing Pietermaritzburg and Mooi River. Take exit 194 for R74 toward R103/Colenso/Bergville. Turn left onto R74 towards Winterton. Carry on R600, straight for about 30 km's. Turn right into Dragon Peaks/Drakensberg Boys Choir/Mount Champagne entrance. Turn left at boom & travel for 1km. Check in at Mount Champagne reception. Take the N3 to Durban through Tugela Toll, travel for 14 km's and take the Bergville off ramp. Carry on straight for about 30 km's. Turn left at the boom & travel for 1km. 996 page views since 17 Oct, 2018.